SAN FRANCISCO — Obsello, an authentic Spanish absinthe verte, is quickly becoming recognized as the highest quality absinthe available to U.S. consumers. Obsello officially launched last month in San Francisco and has been picked up by scores of upscale restaurants, bars and night clubs in S.F., Los Angeles, and, now, New York. Among some of the award-winning establishments to offer Obsello are White Star and Little Branch in New York, Hungry Cat in Los Angeles and Michael Minna’s establishment in San Francisco. Each location maintains a spotless reputation for superb culinary or mixology talents, service and ambiance. These venues are the hallmarks of a growing list of celebrity mixologists and chefs who are turning their clients toward Obsello for a taste of what absinthe should be. 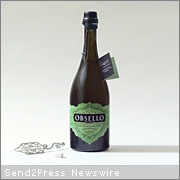 Please visit us at http://www.Obsello.com and experience absinthe again for the first time.